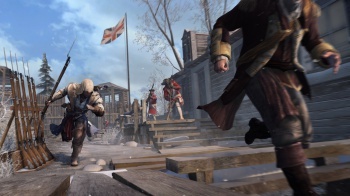 Connor's hood will return to normal after turkey day thanks to a slew of improvements for Assassin's Creed III. Next Thursday is Thanksgiving in North America, and gamers may want to give thanks to Ubisoft's turkey day Assassin's Creed III patch. Though Assassin's Creed III does a lot of things well, many players have experienced glitches in both the PS3 and Xbox 360 versions of the game. Responding to feedback received on forums and social networks, Ubisoft has announced the Thanksgiving patch for Assassin's Creed III, which promises to fix dozens of issues across the single-player and multiplayer gameplay. Gamers will be relieved to find that the patch returns "Connor's hood to normal behavior," but even more importantly, it claims to fix "rare occurrences of glitches blocking your progression in the main story and secondary missions." There are also tweaks to improve multiplayer connections and rankings, fixes for various visual glitches, and a few system-specific changes for PS3 and Xbox 360. The full list of changes, most of which are for both platforms, can be found here; be warned, you might run into spoilers if you're not that far into Assassin's Creed III. I found this note to be particularly interesting: "SINGLE-PLAYER - Reduced difficulty of certain chases." All I'm saying is, that better refer to Sequence 8.